My students have been doing so well with my “kernels” concept that I’ve decided to write up a real challenge for them: cascara with the clave in the left foot. It was the hip thing du jour two years ago, and it will still blow away the other kids around the band room. The kernel of the kernel concept is to find the natural clumps of notes within a pattern, and practice them in isolation at the final performance tempo, or close to it, and then stringing them together. 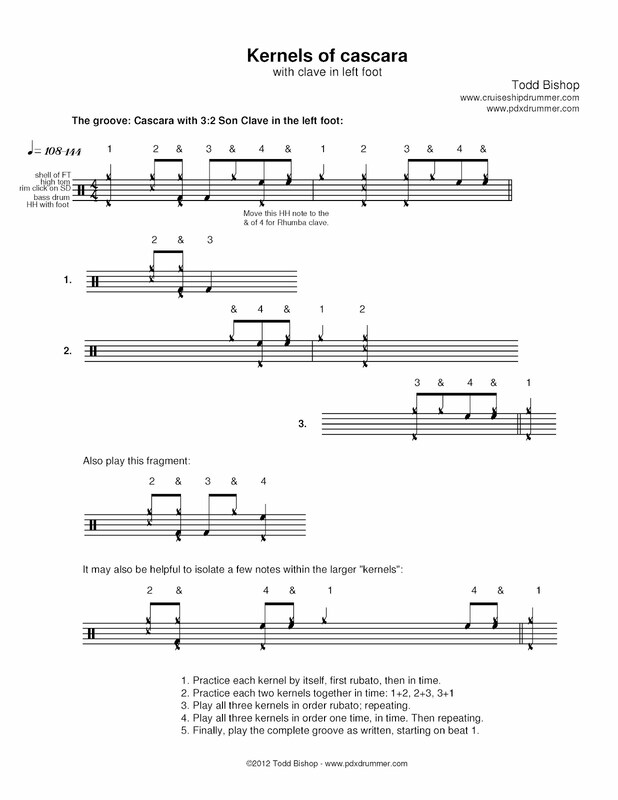 As I’ve said before, the cool thing about this approach is that it helps fairly inexperienced drummers to get difficult things up to speed in fairly short order. It also insures that the internals of the pattern are solid. I’ve found it to be a nice addition to the usual slow-to-fast way of overcoming coordination challenges, and much more effective than the equally common (in the practice room, anyway) brute force approach, in which students inevitably spend a lot of time practicing mistakes. Instructions are in the pdf; it’s a good idea to count each kernel out loud as written as you play them. After mastering the coordination by this method, it’s important to bring it back around to perceiving the groove in its usual musical sense, paying special attention to how you are interpreting the palito pattern in the right hand and the clave in the left foot.